Since 2001 Kathleen Pleasants has been teaching Reiki to people from all backgrounds; not limited to age or species. USUI REIKI – Small classes for better learning. All levels are one day. 6 CEs per level. Reiki Level One is a necessary first step in learning how to practice Reiki and you may choose to remain at this level or proceed to Reiki Level Two in order to learn how to deliver Distance Healing and offer therapy to your friends, family and/or clients. note: The Reiki attunement lasts a lifetime and if a mother attends during pregnancy, her unborn child will receive the attunement as well and we will award a certificate to the child as a level 1 practitioner. It combines related history, theory and all of the practical skills you will need in order to practice Reiki self-healing. note: Reiki can be given to cats and every time they are near you and purring, their Reiki will flow. The natural loving and healing energies we get from our cats becomes even more enhanced. Reiki Level 2 is the next step in learning how to enhance the energy you have learned and been using. You will receive symbols that have distinct meaning and powerful purpose; where and how to use them. You will be able to send Reiki at a distance to anywhere in the world as well as the past and future. Take your practitioner practice to the next level. Reiki Level 3 is the highest level in Usui Reiki where you will receive the Master Symbol. This magnifies all of the other symbols and will bring in the greatest flow into your practice and to your recipients. You will learn how to build a Reiki Grid and send Reiki to anywhere and any situation 24/7. As a Reiki Master you can enjoy knowing that you are giving the highest level of Reiki in your practice and can choose to teach this ancient art yourself through our Teacher Level. After taking all three levels, you are ready to take the next, becoming a teacher. Not everyone wants to teach Reiki, but if you do, you can share this wonderful healing art with others as a part of your growing and thriving practice. 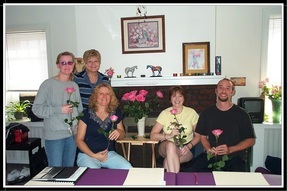 You can teach Reiki to your family, friends, clients and groups. The opportunities are large and Reiki is well known and accepted by many worldwide. Whether you have taken your Reiki classes somewhere else or through the Clearly Unique Learning Institute, you can repeat a class for a small fee and still gain the full CE credits for attending and participating. Repeating adds depth to your experience in the different levels and helps to refresh and inspire new outlets for this valuable technique with the added bonus of making new friends.